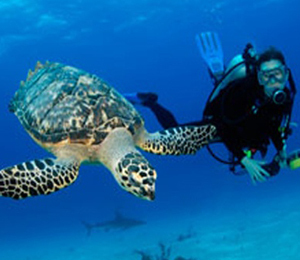 Have you always dreamed of going scuba diving but never had the chance? Then take a good look at this fabulous tour! Our Stuart Cove Learn to Dive Resort Course has been designed for the beginning diver who would like to experience the beauty of our underwater paradise. This quick and fun introductory diving course will prepare you for an exciting afternoon of open water reef diving. We assure you that once you have completed our Learn to Dive Resort Course, you will be ready for a lot more scuba diving! You will be instructed by diving professionals who have been certified by PADI and are highly familiar with the area and its amazing scuba diving locations. After an introduction to the basic techniques and safety regulations and recommendations of scuba diving, you will be ready to go into the water. In a safe location, such as a pool, you will have ample opportunity to familiarize yourself with the scuba diving gear. Our divemaster will be with you at all times and answer all your questions and correct and guide your techniques. And now it's time for the best part! Step onto the boat and let's head out to the marvelous coral reefs with their fabulous marine life just a short distance from New Providence Island. As you are diving into the pristine waters, your divemaster will ensure your safety and comfort while you explore colorful corals, schools of tropical fish, and marine inhabitants such as turtles and stingrays. don't miss out on this fascinating experience, and let us introduce you to the techniques and equipment of scuba diving. Our divemasters are looking forward to making your Caribbean diving dreams a reality! This is a quick and simple learn to dive program. Persons who have never tried diving before can dive without being certified. This course includes a short lecture, water skills practice & a one tank boat dive with your instructor. There are no requirements to be met in order to participate in this dive. Yes, there is a restroom or "Marine Head" for use on the boat. I have been to the Bahamas many times, but Stuart Cove Learn to Dive Resort Course is one of my favorite trips! It includes everything that everyone should do here. As a Bahamas veteran, I can say only the best about this experience!